Disclaimer: I’ve used some Blueprint code on my Character’s blueprint just to avoid classes which fall off the scope of this tutorial. In case you want to create this system using C++ only, you can read this post in order to convert my logic to C++. You can find all the code for this tutorial on my github repo. 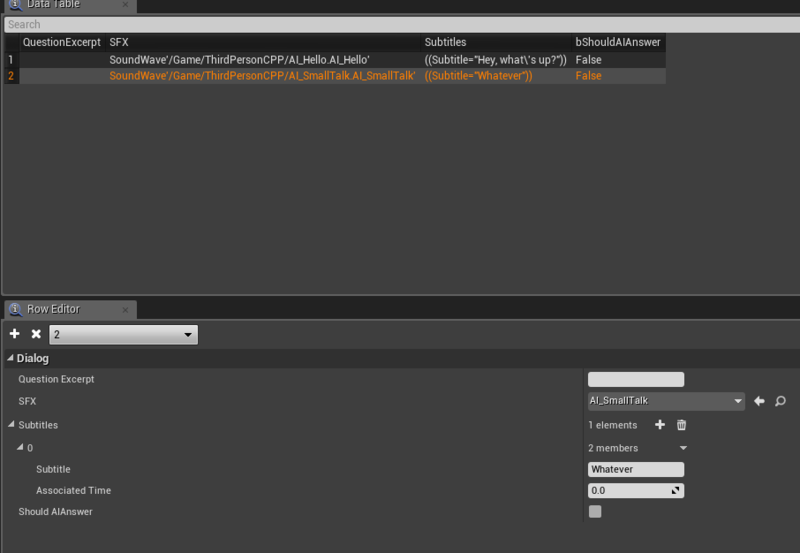 In order to determine when our UI should show the subtitles of our dialogs we’re going to use two structs. The first, will include the excerpt of the players’ choice (this will appear inside the buttons of the UI), the corresponding sfx, an array of subtitles and a bool variable which will be used in order to determine if we want the other pawn to respond. The second struct is the subtitle itself. Each subtitle includes the associated text that will be shown inside our UI as well as the associated time, in seconds, which is the time that the subtitle will appear on our screen. This is identical to how subtitles work for movies! Note that the time in this case is relative – an associated time of 0 seconds means that the subtitle should appear when our sfx starts. An associated time of 1 second means that the subtitle should appear 1 second after our SFX has started playing. Since I recorded myself using audacity, I’ve used it’s interface to determine the actual time for each subtitle. 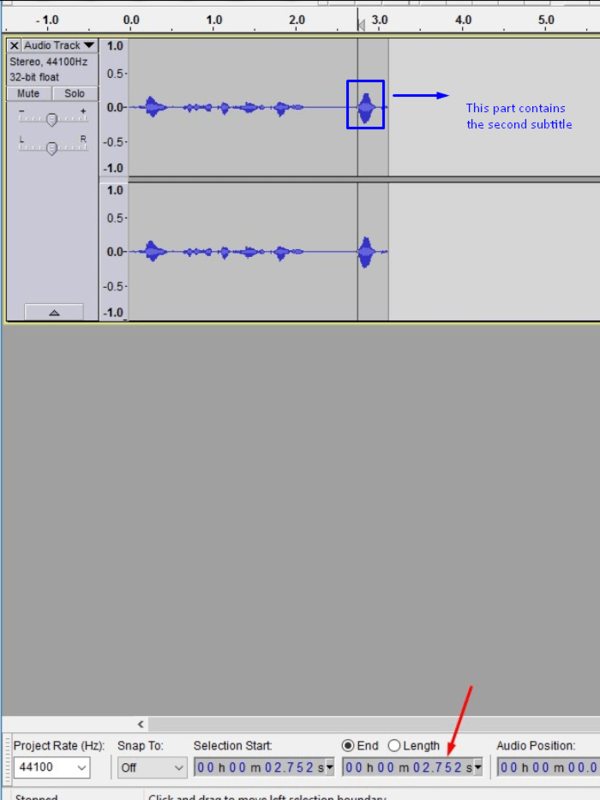 Notice that I have selected the time right before the second subtitle should go off and audacity informs me (see the red arrow of the screenshot) that this sound will be played after 2.7 seconds. This value is the associated time. Now you know the workflow to find the correct associated time without hardcoding or guessing! I suggest to create your recordings at this point since we’ll be focusing on our code from now on. Note: As a convention from this point I will refer to the second pawn as an AI. Don’t get confused – this post contains no AI at all! Make sure that both the Player Lines and the AI Lines have the same row names. This has to do with the code that we’re going to implement later on. In the AI table you can omit some fields, like QuestionExcerpt and the ShouldAnswer variable because we won’t use them. For now, implement all the functions we’ve added by adding no code inside them. We will implement them later on! Let’s leave the AI for now. We’ll come back later on to implement more of it’s functionality. #include "Runtime/UMG/Public/UMG.h" #include "Runtime/UMG/Public/UMGStyle.h" #include "Runtime/UMG/Public/Blueprint/UserWidget.h" #include "Runtime/UMG/Public/Slate/SObjectWidget.h" #include "Runtime/UMG/Public/IUMGModule.h"
Moreover, don’t forget to add the Dialog.h file. Implement an empty logic for the UpdateSubtitles function for now. Compile and save your code! Make sure to bind the variable SubtitleToDisplay in the middle text box. Moreover, mark the Q1,Q2 and Q3 text boxes as variables. Note: You could bind C++ properties to these text boxes as well. I just used this way instead in this case! Let’s leave the UMG for now and implement some logic on our character! //The associated pawn is polite enough to face us when we talk to him! //Just a hardcoded value in order for the AI not to answer right after our subs. //It would be better if we expose that to our editor? Sure! //Tell the associated pawn to answer to our character after the specified time! 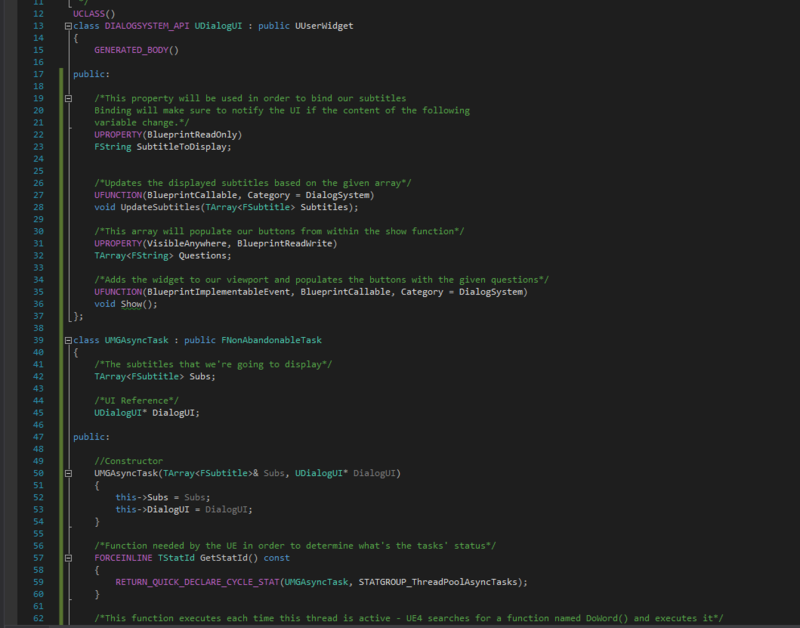 Now we are ready to implement the logic inside our dummy AI. Note that The Associated Text Block is a Text Reference. The last piece of code is kinda catchy, so before we type in our code, I will explain why we need this particular approach. As users, we need every software application to be responsible at any given time, even if the application is going into crash we need to be informed so we can take action. This is done by using Multithreading. In every application (including games) the thread that is responsible for the UI is considered as the main thread. By using multiple cores of our CPU in our application we are able to perform relatively heavy calculations in another thread while our main thread remains responsive. In this post we’ve said that we’re going to wait for a certain amount of time before we display our subtitles, which is totally fine. But if we “freeze” our UI the whole game will freeze. You definitely don’t want that! That’s why, I’ve used multithreading in order to update the subtitles in time. I’ve created a low priority thread in order to update my UI subtitles. This thread literally pauses it’s execution until it’s time for the next subtitle to be shown. Since this thread is a different than the main thread our game won’t get paused and the user won’t notice a thing! 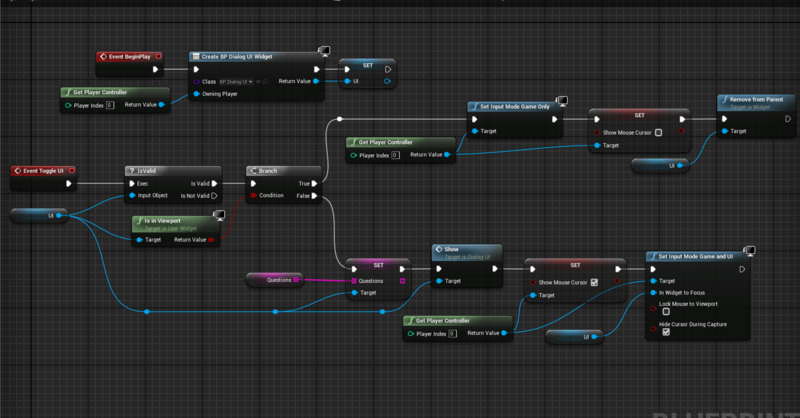 Luckily, Unreal Engine provides an easy way to achieve multithreading! Compile your code and test your system! In the screenshot right after the section “Revisiting our UI” the blueprint calls the Talk function, but in the C++ class, the subtitle is a parameter, not a return value (i’m implementing everything in C++ like in the Inventory tutorial), so what’s happening? The subtitles array is passed by reference. Since we pass a value by reference (which doesn’t include the const keyword) in a function, it means that the function will modify the given value by some way. 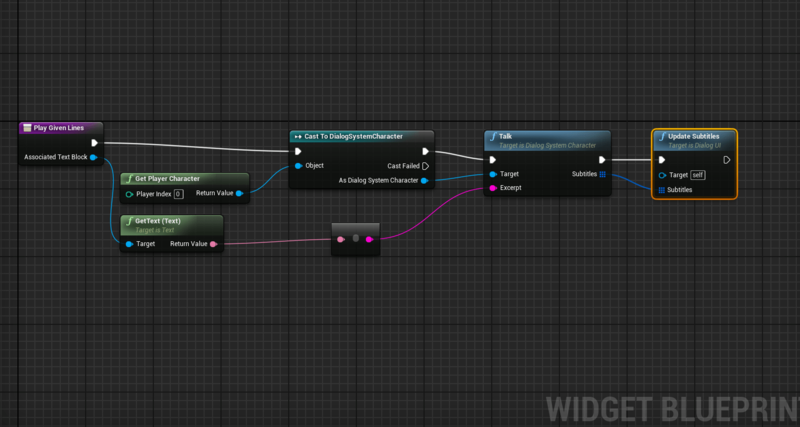 UE4 translates this function with an output pin in the Blueprint graphs. Ok got it 😉 oh btw i’ve been trying to implement drag and drop functionality to your inventory system tutorial in C++, but i’m having kind of a hard time doing so :p do you think you could do a tutorial on that? I don’t think I’m going to expand old tutorials at this time. However, I’ll see if I can integrate this functionality in a future tutorial. Actually no i don’t got it… how do i get the subtitles to pass as a parameter in the talk function? You can’t do that on the Blueprint side. A workaround would be to create a BlueprintCallable setter function. I implemented this code as you have it, and I double checked everything. I’m not getting any errors, however the game is crashing when I run to the AI and overlap the box. From what I can gather, the issue is a null pointer in GeneratePlayerLines function. It seems like the array is not accessible or isn’t filling in, so nothing can be generated? I’m a complete greenhorn when it comes to C++ and unreal, so this is really throwing me off. Any ideas? 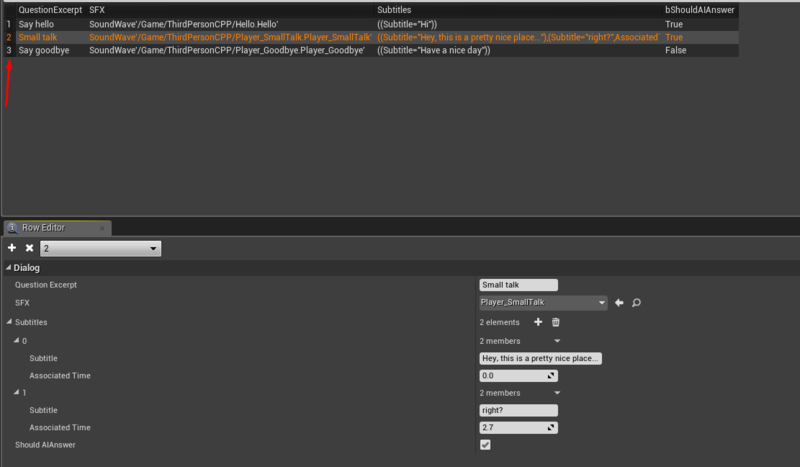 Have you verified that the PlayerLines isn’t null and that your type casting works? That’s the thing, I think PlayerLines might be null, but I don’t know how to remedy that. It’s like the code isn’t able to reference the data table I created in the editor. Have you assigned the required player lines in the corresponding character? Moreover, try to restart your editor and re-run your game. Sometimes this might fix your issue. Additionally, I would suggest to download the complete source code from GitHub and compare it with your local files. I got it working! I didn’t know I needed to go into the blueprint for the AI and updated the dialog section with the appropriate lines. Now I’ve got it working, I just need to troubleshoot the timing of it. In your Revisiting our UI part, where did you get ‘Play Given Lines’ ? Do I need to declare it myself?